Many moons ago, I posted a surprisingly popular answer on StackOverflow regarding how to write to CSV files using PostgreSQL. The answer, in a nutshell, is the COPY statement. But there’s a catch – PostgreSQL imposes strict security limitations on the use of this statement, which are best dealt with using another feature, the SECURITY DEFINER option to CREATE FUNCTION. Here, I will attempt to explain in more detail what these security restrictions are, and how to do what you want without simply disabling that security. COPY moves data between PostgreSQL tables and standard file-system files. COPY TO copies the contents of a table to a file, while COPY FROM copies data from a file to a table (appending the data to whatever is in the table already). COPY TO can also copy the results of a SELECT query. There are, basically, two places a file could be which PostgreSQL is expected to read or write: on the server (i.e. where PostgreSQL itself is running) or on the client (i.e. where your SQL is originating, such as a webserver running a PHP script). If your file is on the server, then the “full” version of COPY is available to you: you can write something like COPY (SELECT * FROM public.foo) TO '/tmp/foo.csv' WITH (FORMAT CSV); or COPY public.foo FROM '/tmp/foo.csv' WITH (FORMAT CSV);. But there’s a snag: you can only use this form if connected to PostgreSQL as the “superuser” (usually called “root”). Why? Because PostgreSQL has no way of knowing which PostgreSQL “roles” should map to which users or permissions on the underlying OS; the process running the DBMS itself may well have access to read and write all sorts of files which you really wouldn’t want someone to get their hands on. In a worst case scenario, an attacker who got hold of an SQL account with COPY privileges might be able to create a back-door to take complete control of your server, and PostgreSQL would rather not be responsible for that! If your file is on the client, then the PostgreSQL server can’t just go onto that remote machine and grab the file – like uploading a file to a website, you need to provide the data in some way. Since as far as it’s concerned, you’re not actually reading a file, just throwing it data, PostgreSQL can apply the same security policy it would if you just wrote a bunch of INSERT statements, and doesn’t need the superuser-only restriction. This is why there are a couple of special cases in the COPY command: COPY FROM STDIN and COPY TO STDOUT. The downside is that it’s up to you to push that data in (or catch it coming out); for instance, graphical tools like PgAdmin III or phpPgAdmin generally have an “Execute query to file” option, which internally sets up a COPY TO STDOUT command and saves the result to disk. The command-line psql interface, meanwhile, has a special \copy command, which you can run as though it were an ordinary COPY statement, but with the file handled by the client, not the server. This could be built in to a shell script, and not needing to copy data to/from the server might be an advantage, but building it into a more complex data import/export system could be tricky. SECURITY INVOKER indicates that the function is to be executed with the privileges of the user that calls it. That is the default. This brief explanation belies the power of this option: you can create a function such that, whatever user actually runs it, PostgreSQL acts as though it were run as a different user – specifically, the “owner” of the function. Obviously, this is a rather awkward function – it exists only to add the SECURITY DEFINER attribute to one line of some larger piece of application logic. You could, though, expand this with procedural code (using PL/pgSQL, or one of the other pluggable languages) to process the whole task – for instance, define a Temporary Table, fill it from an uploaded CSV, sanity-check the data, and insert it into a permanenent table. Rather than expand the function for a specific purpose, you might be tempted to simply generalise it into one which wraps up the basic options of COPY. -- This is a really bad idea. Do not copy this function. This is a really bad idea! The security restriction on COPY is there for a good reason, so simply over-riding it as though you know better is clearly not the way to go. Indeed, you could generalise this further, and write a function which took a string of SQL, and executed it as a superuser – thus giving any user which could execute that function all the rights of a superuser. 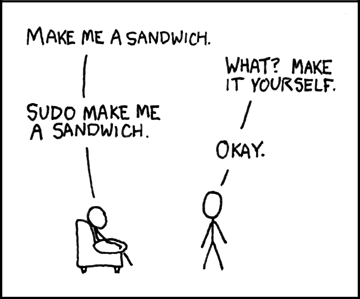 This is actually quite a common mistake; for instance, some Linux systems configure the sudo command so that users can run any command as root at will. Image courtesy of xkcd (Randall Munroe), used under a Creative Commons Attribution-NonCommercial 2.5 License. Also available as a T-shirt. This is no more a correct configuration of sudo than our hypothetical PostgreSQL function is a correct use of SECURITY DEFINER, since it effectively makes users who can sudo into superusers. (It does afford some protection, since the user will generally be prompted for their password, like in Windows UAC; but on a multi-user system, it makes any weak user password into a complete system risk). Rather than “running code as root”, perhaps a better way of phrasing what tools such as sudo and SECURITY DEFINER should be used for is “asking root to run code for you”. The crucial difference being that it is perfectly acceptable – indeed, essential – for root to “say no”, rather than blindly carrying out the requested action. Which files should the user be allowed to read/write on disk? This might be a particular directory, for instance, and the filename might have to have a suitable prefix or extension. You might want to just hard-code as much as possible, but remember to guard against awkward things like /../ and the dreaded null byte. If in doubt, a tight whitelist always trumps an incomplete blacklist. When you find something that doesn’t meet your requirements, you want to abort, and make sure your application knows you’ve aborted, so you will probably want to make use of RAISE EXCEPTION or something similar. You’ll be building dynamic SQL in your function, so need to make sure you’re guarded against SQL Injection. Make appropriate use of the quote_ident and quote_literal functions, which will do appropriate double- and single-quoting for you. Think about which connecting users need to be able to import files at all, and GRANT only those users the EXECUTE permission on your function. That will probably take the form of a “group role” which can then be GRANTed to actual “login roles”, but that’s a whole nother topic. --	as long as the function was created while logged in as a superuser. SECURITY DEFINER functions still respect the caller’s search path. So I could write my own function called public.quote_ident(text), change my search_path to ‘public,pg_catalog’, and have my code executed as superuser. Qualifying every function and operator call will fix this, though it’s a little awkward (each “||” becomes “OPERATOR(pg_catalog.||)”). Alternatively, you can add “SET search_path TO pg_catalog,pg_temp[,…]” to your function header (you can append more schemas to this path as necessary, or just force callers to qualify their table_name). The other issue is that the caller may still lack permissions for the table in question. Naming conventions might be “good enough” in most cases, but it’s still a flaw. I *think* you can solve this with calls to “has_table_privilege(session_user,table_name,)” (though there may be more loopholes I’m not aware of). “session_user” in the context of a SECURITY DEFINER function still identifies the “real” user (as opposed to “current_user”, which gives you the effective role, i.e. the definer). And this privilege check will implicitly validate your table name, so you should be able to throw away your regex without fear of injection attacks. Thanks for the tips! I hadn’t thought of shadowing something as basic as quote_ident(), or the || operator, but I guess there’s no reason you *wouldn’t* be able to, apart from needing to be devious enough to think of it. I’ll play around and update my sample functions to use explicit search paths. As for permissions, I guess it depends on your situation and use case. With a particularly restrictive naming convention (could even be a whitelist of table names), the function could effectively act as an *extra* permission that needs to be granted – “Insert” needn’t imply “Bulk insert”, and “Select” needn’t imply “Dump to disk”. And of course, the whole point of the “superuser only” restriction is that on the filesystem side, we *can’t* inherit from any existing permissions, so all we have to go on is the file path string. Good tip with session_user vs current_user though; I can see various ways that could come in handy. You’re right, naming restrictions can still serve a purpose, but it’s certainly worth doing the privilege check as well, just to be certain that these functions can never be used to circumvent permissions. By the way, there’s a nice variation which lets you lock down your search path, without requiring callers to specify a schema: declare the table_name parameter as “regclass” instead of “text”. It will be implicitly cast to/from text as needed, but it forces Postgres to resolve the table name according to the caller’s search path. Hi, this is amazing piece, you really stressed the importance not generalising which was the first thing I in countered when searching around for uses of COPY function. Thanks for taking the time to right this down. How would this work for stdin and stdout, or is it going to work as stdin and stdout is client side. Copy from stdin or to stdout doesn’t need the same security restrictions, because the data is being provided from the client, just like a standard INSERT.